A colourful original and fun way to highlight issues about healthy eating and promote a healthy school. Interactive and stimulating for children aged 3 to 7. 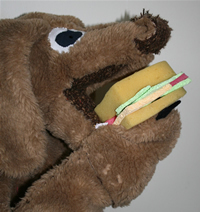 With laughter, songs and real vegetables Jamie the Dog and his puppet friends will show the children why we should all have healthy food and how good it makes us feel. Jamie’s girlfriend, Sugar, loves sweet foods but she isn’t very well and her teeth keep falling out! Their puppies love their lunch boxes but only one of them is concentrating at puppy school. Help Jamie cook up something really tasty and healthy that will please everybody! Alongside this show we can run healthy eating workshops and/or provide lesson plans for school settings.